(ARISE magazine, issue 16) Many people have tried to claim Freddie Mercury as their own. In 2009, Brian May unveiled a star-shaped plaque dedicated to his former bandmate in the London town of Feltham, where Mercury lived when he first moved to England in 1964. Last year The Asian Awards recognised the Queen frontman, who was born to parents from India and studied there as a child. And in Zanzibar, visitors can find a gold plaque outside Zanzibar Gallery commemorating the island’s most famous son, who was born at the Government Hospital on September 5 1946. 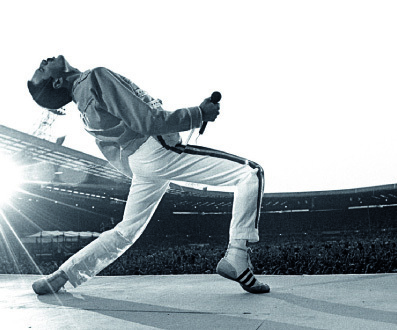 For most of his fans though, Mercury is simply a legend – the musical genius who made Queen famous and dazzled audiences around the world with the always-fulfilled promise: We Will Rock You. Mercury came into the world as Farrokh Bulsara, son of Bomi and Jer Bulsara. In Freddie Mercury: The Definitive Biography by Lesley-Ann Jones, his mother remembers: “As a young boy he was very happy and loved music… I think he always wanted to be a showman”. At the age of eight, Mercury left Zanzibar to go to St Peter’s School in Panchgani, India, where he formed his first band, the Hectics. “I was a precocious child,” Mercury remembered in an interview with Melody Maker in 1974. “My parents thought boarding school would do me good so they sent me to one… I look back on it and I think it was marvellous. You learn to look after yourself and it taught me to have responsibility”. It was also here that Farrokh got his nickname Freddie, though it wasn’t until moving to England that the transformation from Bulsara to the intergalactic Mercury would happen. In The Definitive Biography, a friend recounts his memories of hanging out with Mercury on his return to Zanzibar: “We’d cycle to Fumba in the south, Mungapwani in the northeast, the site of the old slaves’ caves… we’d swim, eat snacks, climb coconut trees. We were mischevious but not bad”. Away from their youthful adventures, however, a political and social storm was brewing. After gaining its independence from Britain in 1963, Zanzibar’s power passed into the hands of an Arab ruling elite – despite the Afro-Shirazi Party winning 54 per cent of the electoral vote. Furious that the party, which represented Zanzibar’s African majority, had lost out, revolutionaries overthrew the Sultan and his government in 1964. In the aftermath of the coup, Arab and South Asian Zanzabaris were targeted in reprisal attacks. A headline from a Los Angeles Times report of the time declares “Hasty Mass Burials Prevent True Count; Toll of ‘Political Suspects’ May Hit 4,000”. Years on, the BBC website is no closer to knowing an exact figure – saying only that “as many as 17,000 people were killed”. During these events, the Bulsara family fled the country – with England in their sights. For Mercury, the move opened a world of possibilities. “He really wanted to come to England,” his mother later told BBC radio. “Being a teenager, he was aware of these things in Western countries and they attracted him.” In London, Mercury flourished. After A-Levels, he enrolled on a course at Ealing College of Art, where he met bass player Tim Staffell, who was in a band called Smile with May and Roger Taylor. In 1970, Mercury replaced Staffell, and Queen was born. While in South Africa, the band made some amends. As Mercury rested a damaged throat, which had led to several cancelled dates, his guitarist accepted an invitation to present an award in Soweto. “Moved by the welcome he received, May vowed that Queen would come back some day and play for the Sowetans,” recounts Phil Sutcliffe in Queen: The Ultimate Illustrated History of the Crown Kings of Rock. While Soweto is still waiting for its show, Queen have since performed elsewhere in South Africa – namely at Nelson Mandela’s 46664 charity concert in March 2005. But the show went on, of course, without Mercury, who died in London on November 24 1991 of Aids-related bronchial pneumonia. The 45 year old had publicly announced he was HIV positive just 24 hours before. Whether his decision to hide his background was born of a desire to fit in, a lack of interest or self-denial, Mercury’s loss of contact with his Zanzibari roots – and the exodus of 1964 – means little is known about his time on the island. “I don’t know anything… there is no one left here who knows” a local Indian shopkeeper says in The Definitive Biography (first published in 1998). “Local people don’t understand. Who was this person anyway?” Since then, however, few can have failed to have heard of Mercury. In 2006 a Freddie Mercury-themed restaurant on the waterfront of Zanzibar’s capital city, Mercury’s, drew up plans to hold a 60th birthday party in the singer’s honour. However the celebration was cancelled after the Association for Islamic Mobilisation and Propagation declared: “We do not want to give our young generation the idea that homosexuals are accepted in Zanzibar”.